THE FALL : “LIVE AT THE WITCH TRIALS” 2xCD…..
A year back I took a stab at what I considered to be the “Top 10” records by one of my small handful of favorite rock bands ever, THE FALL. “Live At The Witch Trials”, their 1979 debut, happened to be just the second Fall record I ever bought, after being blown away by “This Nation’s Saving Grace” in 1985 and resolving to delve into their back catalog at once. For the purposes of my top 10 list, “Witch Trials” ended up at #9, simply because once I discovered 1980-83 FALL (“Hex Enduction Hour”, “Perverted By Language” and the rest) I was hooked in for life and elevated those instead to near-constant turntable airtime. Those records still remain among my all-time favorites. This was the era in which The Fall shed any punk pretensions and the lingering influence of being birthed in the first wave of 1977 Manchester snottitude, and instead embraced the trippier, more experimental sides in Mark E. Smith’s record collection and incorporated Can, Van Der Graff Generator and Velvet Underground influences (while sounding nothing like those bands). Songs became longer, subject matter even more obtuse, and their trademark repetition more jarring and unnerving. But that’s why The Fall will always be ranked as one of the true innovators of the punk era, and amazingly continue to do great, complex, progressive work to this day (as I had to be reminded last year). I had reconstituted my Fall collection on CD in recent years, selling off the old LPs, and it turned out that “Live At The Witch Trials” was the last pre-’85 masterpiece I needed. One thing I learned is that I’ve been shortchanged – all these years I’ve owned the American version of this record, the red one on IRS. For reasons unbeknownst, IRS lopped off 2 (great) tracks from the UK version, “Mother-Sister” and “Industrial Estate”, and substituted the masterful, depressing b-side “Various Times” in their place. Didn’t know that until I picked this up, and the rollicking, rifftastic “Mother-Sister” is brand new to me. Hallelujah! You may be aware of the sheer deluge of Fall product on the market of late; I can’t visit my local CD emporium without finding some new repackaging of the band’s glory years in some form or another. 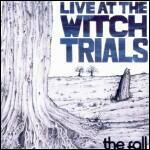 Not that I’m complaining, as this double CD version of “Witch Trials” is what got me over the goal line to purchase. What’s this one got the others don’t got, you ask? Not only is the original UK version of the LP on here, ya get the “Bingo-Masters’ Breakout” and “It’s The New Thing / Various Times” 45s. You also get to hear three of the earliest 1977 recordings the band made in rehearsal, commonly known as the “Dresden Dolls” recordings, after the bootleg EP they’ve also appeared on. There’s also their 2 buoyant “Short Circuit – Live at the Electric Circus” tracks, “Stepping Out” & “Last Orders”. That’s all on disc one – Disc Two contains the 2 John Peel sessions they recorded in 1978, the ones that made Peel such a tireless and fanatical cheerleader for The Fall in subsequent years (he’s claimed on more than one occasion that The Fall were and remain his favorite band). Finally, there’s a 1978 show from Liverpool played in the shadow of grime & general UK decay, with Smith taunting the audience every time the band gears up to play a “slow” one (like the creepy-crawl “Frightened”, easily my favorite Fall track of the early years). I’m pretty sure this same show is available as a CD in its own right, one that I bought at one point and sold off to put food on the table & buy the family shoes for the winter. The whole collection adds up to an insightful look at The Fall’s earliest stirrings, a time when the band was successfully incorporating raw Pistols-style punk aggression, tinny organ plinking and Smith’s bizarre vocal affectations, while learning and growing into a trailblazer and signpost band for “post-punk” in their own right.